Director of quality manages and supervise the quality control team of an organization and ensures that the product deliverables meet the quality and safety standards. 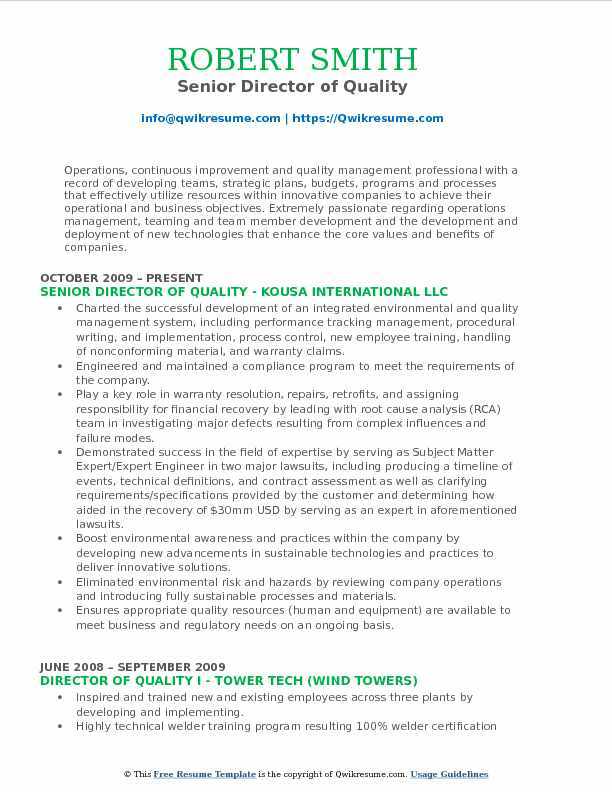 Usual duties listed on the Director of Quality resume include – conducting quality control programs, testing products, updating database of defective products, training and mentoring employees, delegating tasks, initiating and implementing quality improvement activities, establishing metrics, performing root-cause analysis, developing quality planning methods and overseeing calibration and testing programs. Candidates aspiring to become quality directors should exhibit throughout the resume qualifications such as – quality control knowledge, thoroughness, problem-solving skills, and time management. Additional skills like a solid understanding of Quality control procedures, working knowledge of data analysis and MS Office proficiency will be advantageous. While an engineering degree is considered mandatory for this post, holding a Quality control certification will be a great plus. Summary : A proactive and result oriented professional with over 15 years of experience in Quality Management System deployment & Continuous Improvement. Implement the latest quality processes and bring direct and measurable profit improvement to a professional manufacturing organization through my years of experience in the field of quality management with demonstrated ability to deliver mission-critical results. Educated clients on different statistical models with respect to population surveying. Allowing for re-negotiated contracts to reduce costs of key performance measures. Implemented new modality for surveying for clinical & loyalty survey assessments. Developed client satisfaction and loyalty program which identified key clients at risk for termination. Worked with client management to address action plans and have retained several key clients due to the identification process. Introduced lean / six sigma to the organization and realized improvements in the efficiencies by $120k in first six months of implementation. Hired black belt and introduced and implemented independent verification & validation organization whose goal was to reduce noncompliance, build confidence in performance metrics and improve efficiencies with supervisors. Resolved quality issues with suppliers, as well as internal and external customers. Member of the team reducing product line backlog by 90%, and improving on-time delivery by 20%. Headline : Utilize my experience and manufacturing industry knowledge to lead improvement activity for all levels of production, quality, associate engagement, scrap and waste reduction while maintaining Safety, Quality, Cost and Delivery targets in a thriving committed company environment. Responsible for all aspects of quality throughout the company including distribution, QC, packaging, and manufacturing. Continuously improve the quality management systems including appropriate use of statistical process capability. Ensure quality oversight of 3rd party suppliers for the company distributed products throughout the product lifecycle. Ensure that process validation protocols and reports, method validation protocols and reports, specifications and test methods are reviewed and approved to facilitate technology transfers and product launches. Manage multiple sites and work with the development team to complete the clinical projects in a timely manner. Provide guidance on quality compliance improvement and delivery and services to assure sites are always prepared for regulatory inspections. Ensure quality management systems are in place, in use, and effectively monitored to facilitate compliance with CGMP/GCP and to enhance quality management through continuous improvement, and create a culture of accountability within the facility. Manage cro audits, FDA general and PAI inspections, internal and external audits; including commercial and CTM complaint investigations and deviations. 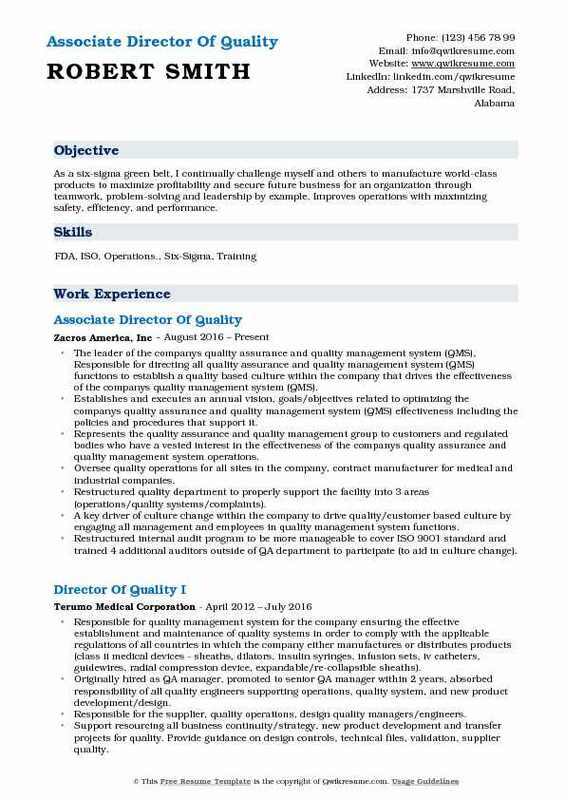 Summary : To obtain a management position as a Director Of Quality within a reputable organization where I am able to utilize my leadership, training, management, operational, project management, quality assurance and regulatory knowledge, experience and skill set in order to drive growth and continual improvement to not only meet the companys objectives, but to achieve operational excellence. Advised and collaborated with CEO on strategic planning and partnerships. Served on the executive leadership board, second in command at the agency, fill in for CEO as needed. Developed a quality department within the agency and five locations. Supervised program directors and other staff at each location and in each department. Designed a grievance and discharge process including policy, forms, and procedures. Responded to and resolved the calls made to the corporate compliance hotline and the grievance hotline Grievance liaison for the state and county completed the investigation and resolution process. Designed, created and completed a vocational assessment and IPOS to ensure consumers dreams and desires were met. Worked with many government programs such as HIPAA legislation, privacy laws, federal regulations related to Medicare parts c and d, health care reform, federal programs. Worked with the EEOC laws, department of labor and ADA to ensure compliance. Supervised vocational services in three different school districts including supportive employment and job coaching services. Completed vocational counseling in order to ensure the consumer had a plan developed for their services. Responsible for creating and analyzing benchmarks in accordance with the agency goals and objectives. 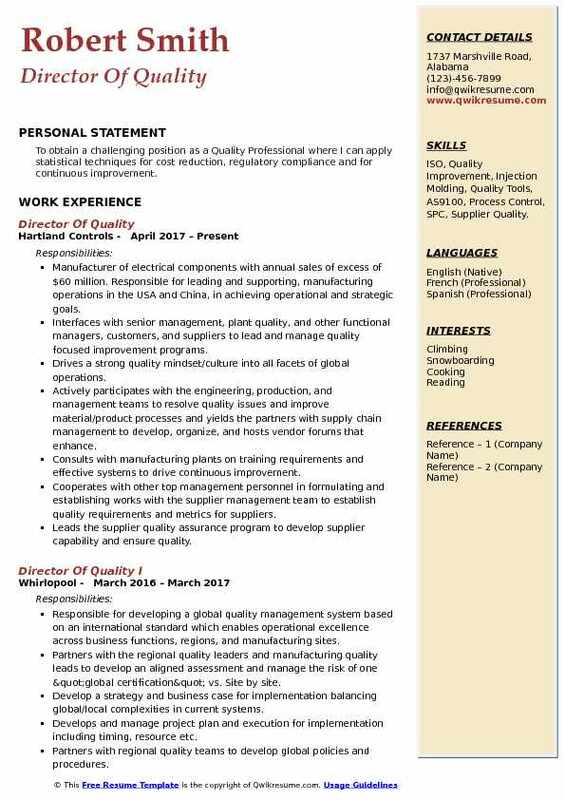 Summary : Degreed double-major Mechanical and Industrial Engineer with a broad-based manufacturing background and over 15 years of experience in Production and Quality related Functions. Proven ability to motivate others to achieve goals. Strong Communication skills and proven Customer Service Experience. Establish a quality strategy and plans to proactively address internal goals and customer requirements. Proven success in implementing productivity-enhanced systems, improved engineering, and production methods. Manage environmental, health and safety. (certified LTUR planner, tier 2, stormwater). Manage engineering, quality, safety requirements and written procedures. Performed duties of the plant manager and materials/scheduling manager. Executes the monthly corrective and preventive action meeting, including the compilation and presentation of qms data. Maintains the customer complaint system to ensure rapid response to customer quality-related concerns. Develop global supplier quality manual and audit process to meet acceptable incoming quality levels. Years of management experience in manufacturing, quality, environmental, health, and safety. Summary : A highly accomplished and dedicated business improvement manager with extensive experience in performance/quality improvements, business solutions, best practices implementation, training/development and accreditation. Enjoys fostering knowledge in new topics and facilitating training to build skill sets and enhance the talent within an organization. A top-performing and visionary leader who is committed to achieving profitability and success for an organization. Responsible for overseeing 14 manufacturing facilities and their overall quality performance. Major PPM reductions from 178 PPMs in 2012 to 68PPMs in 2013 and 14PPMs in 2014 to 5PPMs Ytd in 2015. Manage all internal audits as well as external TS16949 audits and scheduling associated. Report directly to the President of the company on all quality related activities. Moved all key processes to corporate level systems, procedures, work instructions, and forms. All plants were stand-alone facilities from a procedure standpoint, customer interface as well as driving all customer specific requirements. Established a customized tracking system for all customer concern issues across the company into one database. Responsible for a staff of 14 direct reports and 18 dotted line reports. 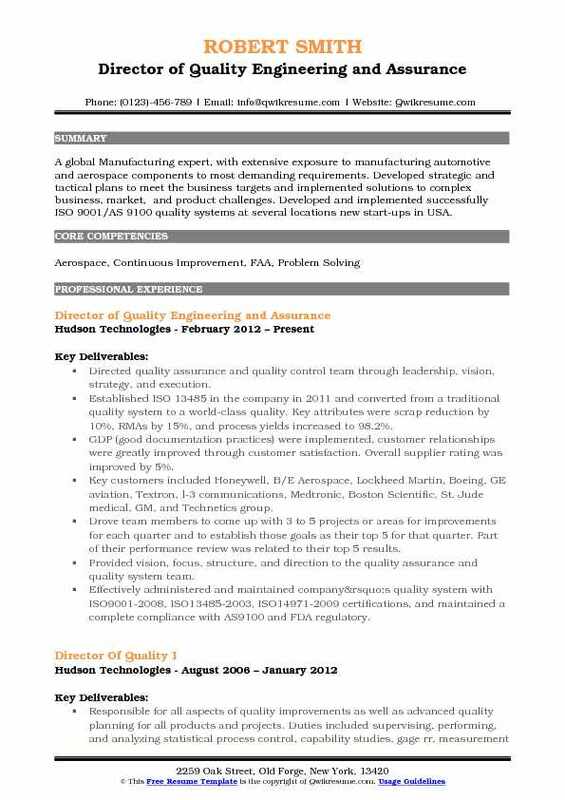 Direct reports include advance quality engineers, corporate quality managers. Dotted line reports include plant quality managers, quality engineers. Established performance KPI tracking system for all 10 plants. This includes KPIs for manufacturing processes as well as quality processes. Monitor and assure APQP reviews are robust and drive plants to review PFMEAS and understand risks up front to mitigate risks during launch. Headline : As a six-sigma green belt, I continually challenge myself and others to manufacture world-class products to maximize profitability and secure future business for an organization through teamwork, problem-solving and leadership by example. Improves operations with maximizing safety, efficiency, and performance. 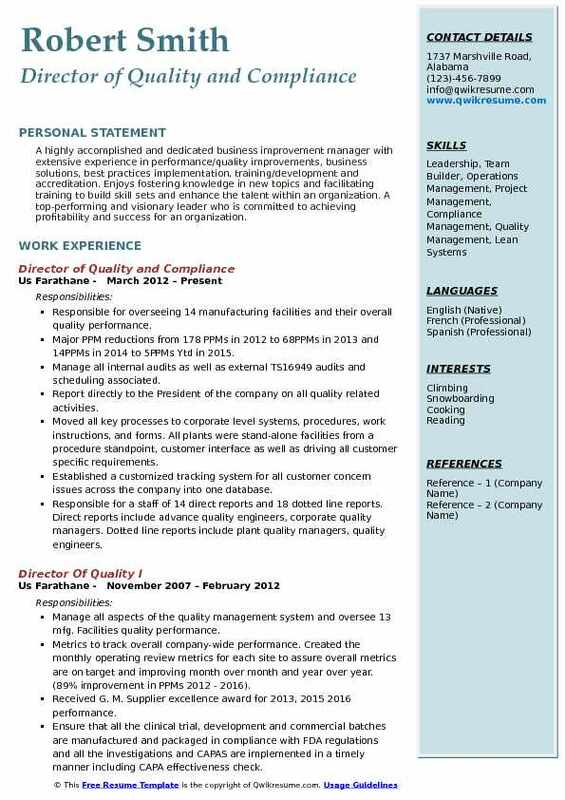 The leader of the company's quality assurance and quality management system (QMS), Responsible for directing all quality assurance and quality management system (QMS) functions to establish a quality based culture within the company that drives the effectiveness of the company's quality management system (QMS). Establishes and executes an annual vision, goals/objectives related to optimizing the company's quality assurance and quality management system (QMS) effectiveness including the policies and procedures that support it. Represents the quality assurance and quality management group to customers and regulated bodies who have a vested interest in the effectiveness of the company's quality assurance and quality management system operations. Oversee quality operations for all sites in the company, contract manufacturer for medical and industrial companies. Restructured quality department to properly support the facility into 3 areas (operations/quality systems/complaints). A key driver of culture change within the company to drive quality/customer based culture by engaging all management and employees in quality management system functions. Restructured internal audit program to be more manageable to cover ISO 9001 standard and trained 4 additional auditors outside of QA department to participate (to aid in culture change). Improved management review to engage entire management staff to drive ownership of quality system and actions. Created nonconformance metrics which did not exist prior. Process/value stream mapped, with cross-functional teams (quality, engineering, sales, maintenance, production, customer service) to improve broken processes of the following: scheduling (taking orders through shipping), nonconformance process, validation process. Summary : Operations, continuous improvement and quality management professional with a record of developing teams, strategic plans, budgets, programs and processes that effectively utilize resources within innovative companies to achieve their operational and business objectives. 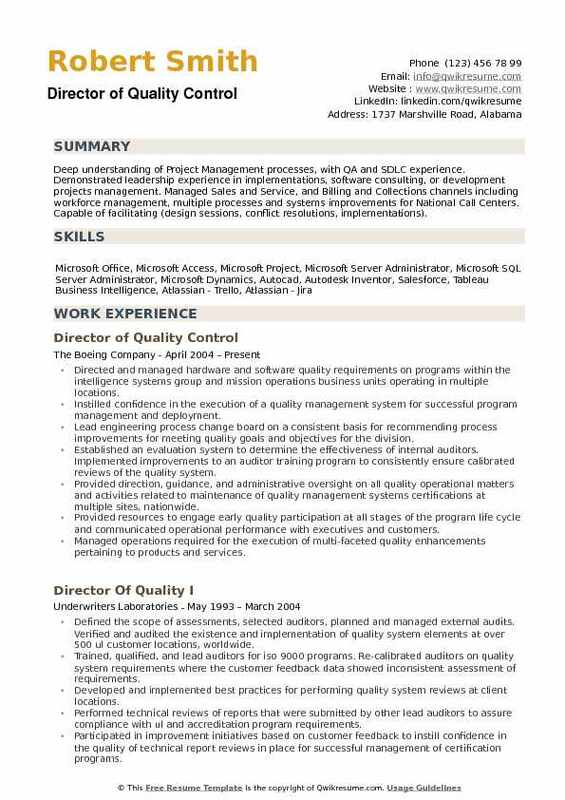 Extremely passionate regarding operations management, teaming and team member development and the development and deployment of new technologies that enhance the core values and benefits of companies. Charted the successful development of an integrated environmental and quality management system, including performance tracking management, procedural writing, and implementation, process control, new employee training, handling of nonconforming material, and warranty claims. Engineered and maintained a compliance program to meet the requirements of the company. Play a key role in warranty resolution, repairs, retrofits, and assigning responsibility for financial recovery by leading with root cause analysis (RCA) team in investigating major defects resulting from complex influences and failure modes. Demonstrated success in the field of expertise by serving as Subject Matter Expert/Expert Engineer in two major lawsuits, including producing a timeline of events, technical definitions, and contract assessment as well as clarifying requirements/specifications provided by the customer and determining how aided in the recovery of $30mm USD by serving as an expert in aforementioned lawsuits. Boost environmental awareness and practices within the company by developing new advancements in sustainable technologies and practices to deliver innovative solutions. Eliminated environmental risk and hazards by reviewing company operations and introducing fully sustainable processes and materials. Ensures appropriate quality resources (human and equipment) are available to meet business and regulatory needs on an ongoing basis. Leads material review board meetings to quickly and accurately address internal nonconforming product. Develops, documents deploys and maintains all components of the quality management system. Summary : A global Manufacturing expert, with extensive exposure to manufacturing automotive and aerospace components to most demanding requirements. Developed strategic and tactical plans to meet the business targets and implemented solutions to complex business, market, and product challenges. Developed and implemented successfully ISO 9001/AS 9100 quality systems at several locations new start-ups in USA. 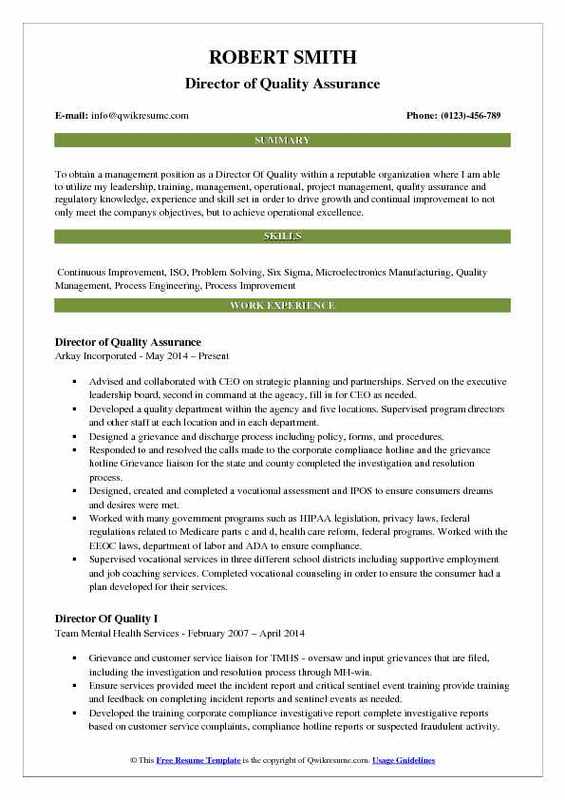 Directed quality assurance and quality control team through leadership, vision, strategy, and execution. Established ISO 13485 in the company in 2011 and converted from a traditional quality system to a world-class quality. Key attributes were scrap reduction by 10%, RMA's by 15%, and process yields increased to 98.2%. GDP (good documentation practices) were implemented, customer relationships were greatly improved through customer satisfaction. Overall supplier rating was improved by 5%. Key customers included Honeywell, B/E Aerospace, Lockheed Martin, Boeing, GE aviation, Textron, l-3 communications, Medtronic, Boston Scientific, St. Jude medical, GM, and Technetics group. Drove team members to come up with 3 to 5 projects or areas for improvements for each quarter and to establish those goals as their top 5 for that quarter. Part of their performance review was related to their top 5 results. 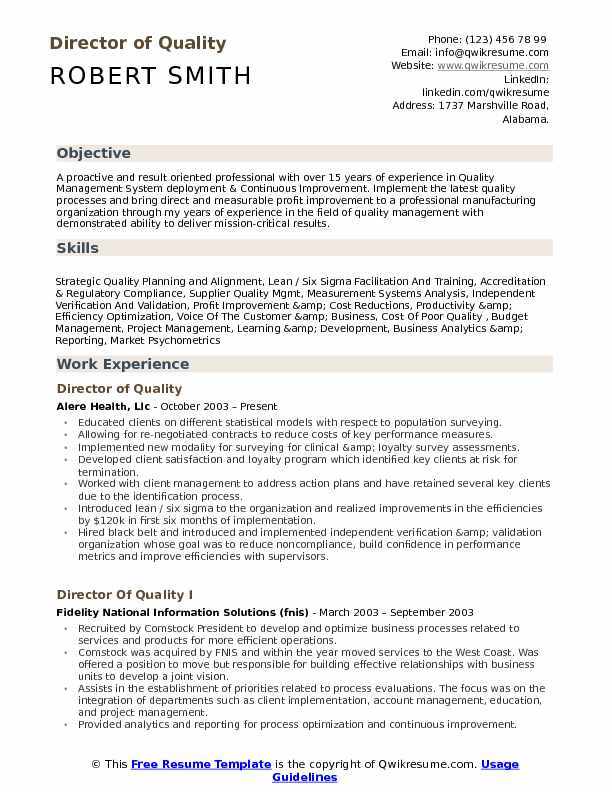 Provided vision, focus, structure, and direction to the quality assurance and quality system team. Effectively administered and maintained company’s quality system with ISO9001-2008, ISO13485-2003, ISO14971-2009 certifications, and maintained a complete compliance with AS9100 and FDA regulatory. Ensured advanced quality planning tools (FMEA, PPAP, reliability and capability studies, CPK analysis, etc. ) were effectively used in the product development phase. Utilized critical to quality (CTQ) and process capability analysis to develop effective and efficient control and inspection plans. 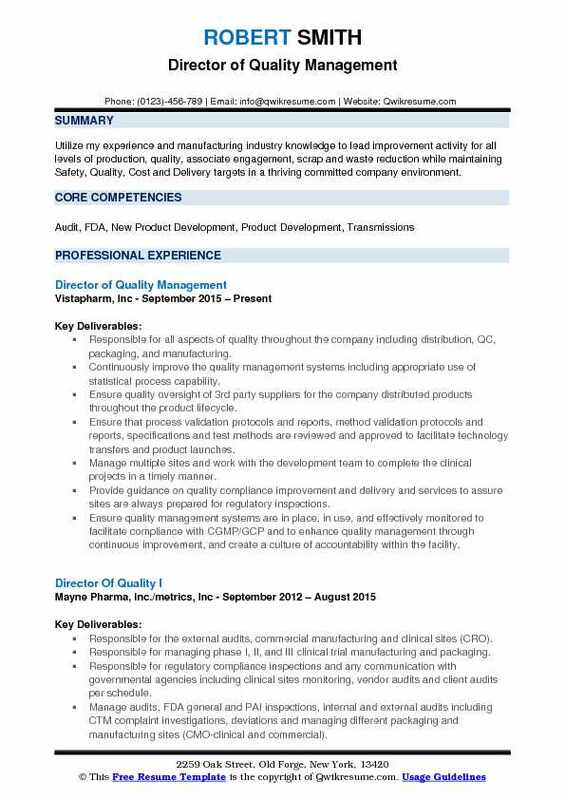 Objective : To obtain a challenging position as a Quality Professional where I can apply statistical techniques for cost reduction, regulatory compliance and for continuous improvement. Skills : ISO, Quality Improvement, Injection Molding, Quality Tools, AS9100, Process Control, SPC, Supplier Quality. Manufacturer of electrical components with annual sales of excess of $60 million. Responsible for leading and supporting, manufacturing operations in the USA and China, in achieving operational and strategic goals. 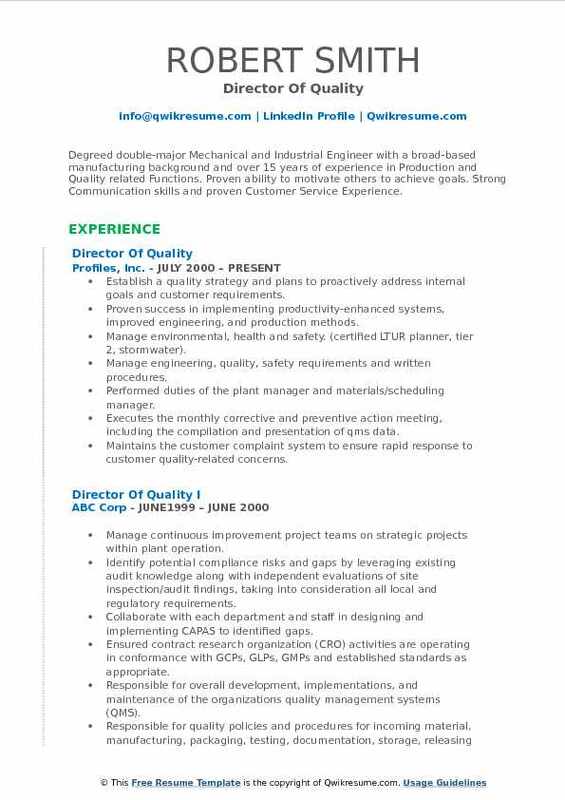 Interfaces with senior management, plant quality, and other functional managers, customers, and suppliers to lead and manage quality focused improvement programs. Drives a strong quality mindset/culture into all facets of global operations. Actively participates with the engineering, production, and management teams to resolve quality issues and improve material/product processes and yields the partners with supply chain management to develop, organize, and hosts vendor forums that enhance. Consults with manufacturing plants on training requirements and effective systems to drive continuous improvement. Cooperates with other top management personnel in formulating and establishing works with the supplier management team to establish quality requirements and metrics for suppliers. Leads the supplier quality assurance program to develop supplier capability and ensure quality. Works with plant management team to establish internal quality requirements and metrics. Leads monthly quality reviews and risk assessments toward achieving quality goals and objectives. Summary : Deep understanding of Project Management processes, with QA and SDLC experience. Demonstrated leadership experience in implementations, software consulting, or development projects management. Managed Sales and Service, and Billing and Collections channels including workforce management, multiple processes and systems improvements for National Call Centers. Capable of facilitating (design sessions, conflict resolutions, implementations). Directed and managed hardware and software quality requirements on programs within the intelligence systems group and mission operations business units operating in multiple locations. Instilled confidence in the execution of a quality management system for successful program management and deployment. Lead engineering process change board on a consistent basis for recommending process improvements for meeting quality goals and objectives for the division. Established an evaluation system to determine the effectiveness of internal auditors. Implemented improvements to an auditor training program to consistently ensure calibrated reviews of the quality system. Provided direction, guidance, and administrative oversight on all quality operational matters and activities related to maintenance of quality management systems certifications at multiple sites, nationwide. Provided resources to engage early quality participation at all stages of the program life cycle and communicated operational performance with executives and customers. Managed operations required for the execution of multi-faceted quality enhancements pertaining to products and services. Provided resources for performing supplier reviews and approvals. Tracked supplier performance, while building a world-class trusted partnership. Assessed organizational quality performance metrics and made a determination for improvements on programs via management of timely and effective root cause corrective actions on product and service quality issues and customer concerns impacting programs.